THE MASKED BEAST - Yu-Gi-Oh! 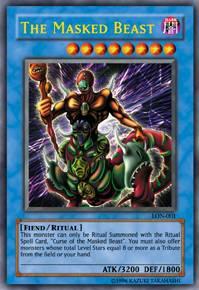 This monster can only be Ritual Summoned with the ritual Spell Card, “Curse of the masked Beast”. You must also offer monsters whose total Level Stars equal 8 or more as a Tribute from the field or your hand.